Barbara Elisabeth Graf, born at Beltane first of May 1968, grew up at the Lake Constance. Active years of learning and teaching: with children in the public education system, commitment as an ecofeminist and in ecojustice movements such as in Labour Unions with the following particular concerns: Liberty for women, justice and consciousness of history. Public relations for Amnesty International, commitment for single prisoners. Active learning- work: to discover and profound the inherent infinite social, emotional and spiritual intelligence through: Analytical bodywork therapy, breathing school, pottery and herbology. Accomplishments as an architect: in the development of analytical models for the architecture for refugees and victims of disasters and the development of economically and ecologically sustainable conversion models for buildings of the industry, the back-formation of cities in eastern Germany and the reviving of peripheral regions in Switzerland. Structure and space-giving work for Autarca. Accomplishments as a Integral Environment healer and reforestation strategist, sister of the spinners, the weavers, the tree singers and sky dancers. Erich Alfried Graf, born on the 19th of October 1965, grown up close by St. Gallen, Switzerland. Active learning and teaching years: in the software industry as a system analyst and with technologies to generate renewable energy. Commitment for pacifism and politically justified refusal of the Swiss military service, profound understanding of the patriarchal financial world. Active learning work: to discover and profound the inherent infinite social, emotional and spiritual intelligence through: ecopsychology such as integral analytical bodywork therapy, breathing school, chant, dance and drumming. Accomplishments as CORE ecopsychology therapist with people and as an integral environment healer, as holistic tree caretaker, strategist for reforestation and a brother of the bees, goats, chickens and earthworms. Common travel and learning years: in communities around the Mother Earth-globe, in organic farming and with Permaculture. Commitment with Brigadas por la Paz and CONAI in Mexico. Public relations work for the peace and the right of self-determination of the indigenous population. Public relations work for a Switzerland without army. Common experiences for the deepening of the inherent infinite social, emotional and spiritual intelligence of our love-companionship through Rebirthing, Bioenergetics, dancing, music and Tantra. Common visions of forested and with life, joy and biodiversity sparkling Canary Islands and the revival of the Sahara. Common activities: Integration of matriarchal awareness in the life- love- and work-companionship. Initiation of Matricultura. 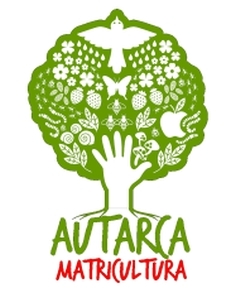 Construction of a real interpretation of Matricultura in the project Autarca. Initiation of the centre for ecological development in the project Autarca. As parents of two children we sing together for the trees, laugh for the stones and spiders, dance for birds and stars, act in the rhythm of the moon, howl with the wolfs, cook with the fire of the sun, heal with herbs, mourn with the dolphins, hit old mattresses, breath with blossoms, circle in the rhythm of the year, celebrate for the love, honour the foremothers, sisters and brothers, stir in the kettle of tolerance, bellow with the lions, take part in the life of the neighbour, play with water and marbles, bless the earth with every step, smoke the air for the goddess, bake the bred with the fire of wood, let the water circle, plant eatable woods, create and connect living-spaces, collect seeds, interchange, invite, drive with the oil of sunflowers, knead compost, release and dance freely with the round dance of the clouds, are happy about the sounds of the frogs and the owls, thank Mother Earth. We experience the salvation in every seed, see the future in every planted tree, we taste the fullness with every fruit and guess the rebirth of new life in the decaying wood.